Martina Santarone graduated with honors from the Santa Cecilia Conservatory as a student of Luca Sanzò. She studies at the Walter Stauffer Academy in Cremona and Siena Chigiana Academy where in 2017 she received a scholarship and merit diploma. With the Werther Piano Quartet she has performed at the IUC in Rome and the Società Umanitaria dei Concerti in Milan. 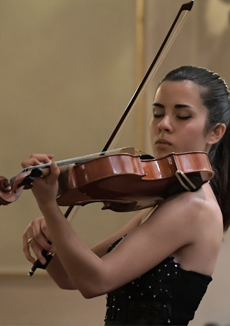 Salvatore Accardo invited her to play with the Orchestra da Camera Italiana, and she has soloed with the Orchestra Sinfonica Abbruzzese, Liceo Musicale Farnesina Orchestra, and at a concert of Paolo Marzocchi at the University Roma Tre’s Aula Magna. To stay in touch with us and get our news join our newsletter. Support the Rome Chamber Music Festival and make a donation.